We Are Marshall is a 2006 American historical drama biopic film directed by McG. It depicts the aftermath of the 1970 plane crash that killed 75 people: 37 football players on the Marshall University Thundering Herd football team, along with five coaches, two athletic trainers, the athletic director, 25 boosters, and a crew of five. Matthew McConaughey stars as head coach Jack Lengyel, with Matthew Fox as assistant coach William "Red" Dawson, David Strathairn as university president Donald Dedmon, and Robert Patrick as ill-fated Marshall head coach Rick Tolley. Then-governor of Georgia Sonny Perdue has a cameo role as an East Carolina University football coach. It was scored by Christophe Beck and written by Jamie Linden. The film addressed rebuilding the program and the healing that the community undergoes. Dr. Keith Spears was the Marshall University consultant. 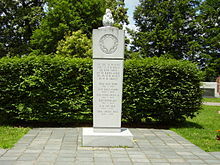 On the evening of November 14, 1970, Southern Airways Flight 932, a McDonnell Douglas DC-9 chartered by Marshall University to transport the Thundering Herd football team back to Huntington, West Virginia following their 17–14 defeat to the East Carolina University Pirates, clips trees on a ridge just one mile short of the runway at Tri-State Airport in Ceredo, West Virginia, and crashes into a nearby gully, killing all 75 people on board. The deceased include the 37 players; head coach Rick Tolley and five members of his coaching staff; Charles E. Kautz, Marshall's athletic director; team athletic trainer Jim Schroer and his assistant, Donald Tackett; sports information director and radio play-by-play announcer Gene Morehouse; 25 boosters; and five crew members. In the wake of the tragedy, University President Donald Dedmon leans towards indefinitely suspending the football program, but he is ultimately persuaded to reconsider by the pleas of the Marshall students and Huntington residents, and especially the few football players who didn't make the flight, led by Nate Ruffin. Dedmon hires Jack Lengyel as head coach who, with the help of Red Dawson (one of two surviving members of the previous coaching staff) manages to rebuild the team in a relatively short time, despite losing many of their prospects to West Virginia University. Dedmon travels to Kansas City, where he pleads with the NCAA to waive their rule prohibiting freshmen from playing varsity football (a rule which had been abolished in 1968 for all sports except for football and basketball, and would be permanently abolished for those sports in 1972). Dedmon returns victorious. The new team is composed mostly of the 18 returning players (three varsity, 15 sophomores) and walk-on athletes from other Marshall sports programs. Due to their lack of experience, the "Young Thundering Herd" ends up losing its first game, 29–6, to the Morehead State Eagles. The loss weighs heavily on Dawson and Ruffin, who had been hurt in the first play of the game. The Herd's first post-crash victory is a 15–13 win against Xavier University in the first home game of the season. We Are Marshall was released on DVD, HD DVD, and Blu-ray in the United States on September 18, 2007. Deborah Novak and John Witek, who produced the 2000 documentary Marshall University: Ashes to Glory, filed a $40 million lawsuit in federal court in California accusing Warner Bros. and others associated with the We Are Marshall film of fraud, copyright infringement, and breach of contract. Novak, who directed Marshall University: Ashes to Glory, is a Huntington native and Marshall alumnus. In October 2008, a federal judge dismissed the lawsuit in a summary judgment in favor of Warner Bros. The film received mixed reviews from critics. Review aggregator Rotten Tomatoes reports that 49% out of 124 professional critics gave the film a positive review, with an average rating of 5.8/10 and the site consensus stating: "Matthew McConaughey almost runs We Are Marshall to the end zone, but can't stop it from taking the easy, feel-good route in memorializing this historic event in American sports." The film's directing was criticized by many reviewers. Peter Hartlaub, from the San Francisco Chronicle, blamed director McG for "half of the movie problems" and went further on saying that "He has a kinetic and kitschy style that could make next year's "Hot Wheels" movie a surprise hit, but he's completely out of place here." Peter Howell from the Toronto Star said the film lacked genuine drama or conflict. McConaughey's performance was, according to some critics, one of the film's highlights. Roger Moore from the Orlando Sentinel gave it 4 stars out of 5 and said in his review that "We Are Marshall (it's the rally cry of the team) doesn't always have a handle on the grief, but it does keep emotions close to the surface. That allows McConaughey to be the most refreshing, funny and believable he ever has been." ^ "We Are Marshall". The-numbers.com. Retrieved November 5, 2014. ^ "Deborah Novak et al v. Warner Bros Pictures LLC et al". Justia Dockets & Filings. Retrieved November 5, 2014. 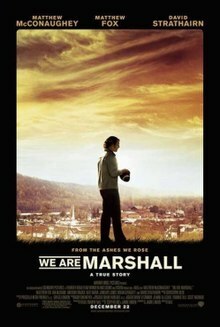 ^ "We Are Marshall". Rotten Tomatoes. Flixster. Retrieved June 23, 2012. ^ "'Marshall' fumbles in telling moving true story". SFGate. Retrieved November 5, 2014. ^ Howell, Peter. "'We Are Marshall': Predictable pigskin tale". Toronto Star. Star Media Group. Archived from the original on June 3, 2009. Retrieved November 5, 2014.